Wicker and rattan add a natural-but-classic look to a design scheme. Wicker and rattan home accessories have come quite a long way. Now these materials are being used for modern, fashionable, even industrial-chic home accessories. Rattan and wicker home accessories are perfect for summer and year-round. Have a look at some cute, modern wicker home accessories. Shades of Light Rattan Bell Chandelier: Minimalist and modern, this chandelier would punch up the look of a kitchen, foyer, or sun room. At $19.99, that's a lot of style for a little money. 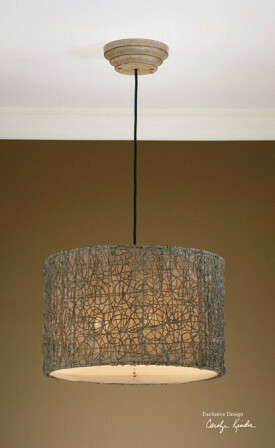 Woven Rattan Lamp Shade from Ballard Designs: This is the perfect woven rattan lamp shade for a classic design scheme. The light woven rattan is almost solid. It comes in 13 inch and 16 inch versions. This is a lovely replacement lamp shade. Why not go for rattan if you're replacing a neutral-colored lamp shade? Knotted Rattan Light Hanging Shade by designer Carolyn Kinder: Mid-century modern style goes natural with this knotted rattan lamp shade. Do you love the modern drum shade look, but need a natural element to tie the room together? A knotted rattan drum shade for a hanging light would be perfect for you. Wicker Concentric Coffee Table from Z Gallerie: This wicker coffee table is the perfect natural accent piece for a contemporary room. Soften up a contemporary design scheme with wicker. This coffee table has strong lines and square shape, but keeps it natural with wicker. Wicker Round Coffee Table from Hickory Chair: This round wicker coffee table is made in America, by craftsmen near Charlotte. It works in a classic, beachy, farmhouse, or industrial-chic design scheme. Its woven wicker legs are quite unique. Woven Rattan Wall Mirror from Crate&Barrel: Mod meets wicker with this woven rattan-framed wall mirror. The chunky frame would look great in a Mission-style design scheme. This is a perfect mirror to hang over a mantel. Jilin Clock: What a cool clock! It looks like it was salvaged from an old barn, but it is refined enough for a farmhouse or industrial-chic living or dining room. This clock is a pleasant surprise! Chaya Kurtz writes about remodeling for Networx.com.